Medium-bodied grey coloured cement for PVC pipe and fittings. Up to 6" diameter. Very fast-setting cement formulated for wet conditions and/or quick pressurization and fast installation. Recommended for ALL grades and types of PVC pipe and fittings, potable water and DWV. Lo-V.O.C. Solvent Cement meets SCAQMD 1168/316A or BAAQMD Method 40 and various environmental requirements. Both Schedule 40 and Schedule 80. Pool / Irrigation. Recommended application temperature 40F to 110F / 4C to 43C. No primer needed on non-pressure DWV, up to 4" where local codes permit. Meets ASTM D 2564. Medium-bodied grey coloured cement for PVC pipe and fittings. Up to 6" diameter. Very fast-setting cement formulated for wet conditions and/or quick pressurization and fast installation. Recommended for ALL grades and types of PVC pipe and fittings, potable water and DWV. Lo-V.O.C. Solvent Cement meets SCAQMD 1168/316A or BAAQMD Method 40 and various environmental requirements. Recommended application temperature 40F to 110F / 4C to 43C. DMX AG Foundation Wrap creates an air gap between wet soil and your basement wall, allowing the poured concrete and concrete block wall to breathe and provides a clear negative side drainage path to disperse any ground moisture that might find it way behind the membrane. Wet soil never touches the wall next to your living space, thus reducing the chances of water infiltration into the basement. Eliminate the need for rubber plugs or mechanical drains with fussy linkage sets. Give your bathroom a luxurious look. This drain operates with ease. Simply push the top down to stop water flow, and down again to release. Drain cleaning is a snap as the cartridge easily screws in and out. Chrome plated. 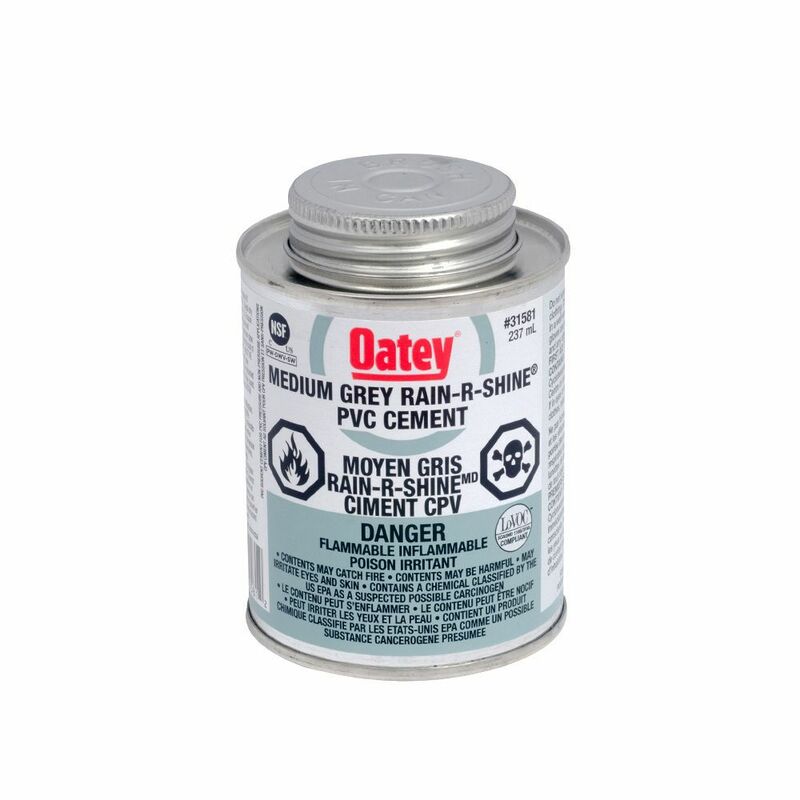 236 Ml Pvc Cement Rain R Shine (C) Medium-bodied grey coloured cement for PVC pipe and fittings. Up to 6" diameter. Very fast-setting cement formulated for wet conditions and/or quick pressurization and fast installation. Recommended for ALL grades and types of PVC pipe and fittings, potable water and DWV. Lo-V.O.C. Solvent Cement meets SCAQMD 1168/316A or BAAQMD Method 40 and various environmental requirements. Both Schedule 40 and Schedule 80. Pool / Irrigation. Recommended application temperature 40F to 110F / 4C to 43C. No primer needed on non-pressure DWV, up to 4" where local codes permit. Meets ASTM D 2564.